What do we mean when we say learning styles? Learning style theories propose that there are certain methods that will enable students to improve their learning. Individual students have innate learning styles that can be discovered and categorized, and when these styles are properly matched with specific pedagogical techniques, academic achievement will increase. For example, a visual learner will benefit most when images are used in class, while an audio learner will achieve more if the same content is provided aurally. Unlike the Learning Pyramid myth that we addressed in a previous post, where all variations in the theory of the pyramid can be traced back to one common point, there are many learning style theories that have developed independently of each other. You are probably familiar with at least a few. One of the most popular learning styles theories is the VARK: Visual, Auditory, Reading, and Kinesthetic, put forward by Neil Fleming (Fleming & Mills, 1992), adapted from Stirling’s VAK. Others include Kolb’s Learning Style Inventory; Dunn, Dunn & Price’s Learning Style Inventory Honey & Mumford’s LS theory with the categories of Activists, Pragmatists, Theorists, and Reflectors. While learning style theories do not have one central root like the Pyramid theory, they do have similarities. 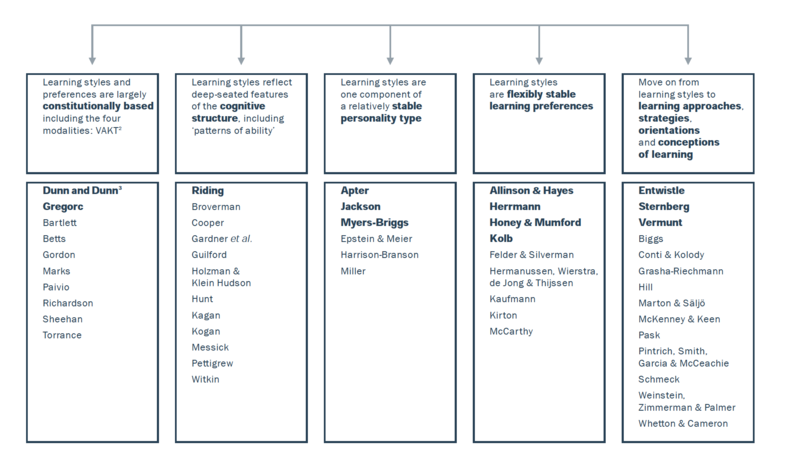 Hyman and Rosoff (1984), identified four common traits in learning style theories: 1) they try to find out what an individual’s learning style is, 2) categorize it using broad categories 3) match it with a teacher versed in that category, and 4) educate teachers to conduct steps 1-3, thereby repeating the cycle and ensuring the theory’s longevity. In Coffield et al.’s systematic review (2004), they categorized over fifty learning style theories by their key concepts, as shown below. While there are many different theories behind learning styles, we will use the general phrase “learning styles,” meaning students benefit most when the teaching mode aligns with their particular style. Higher education literature is full of articles and books about learning styles, and how instructors should tailor their classes to suit different styles in order to support student learning. A quick search in the Library, Informations Science, and Technology Abstracts database showed over 100 articles about learning styles published in just the last 5 years. Many educational articles and websites suggest librarians incorporate different modes of teaching into their learning in order to appeal to the different learning styles. 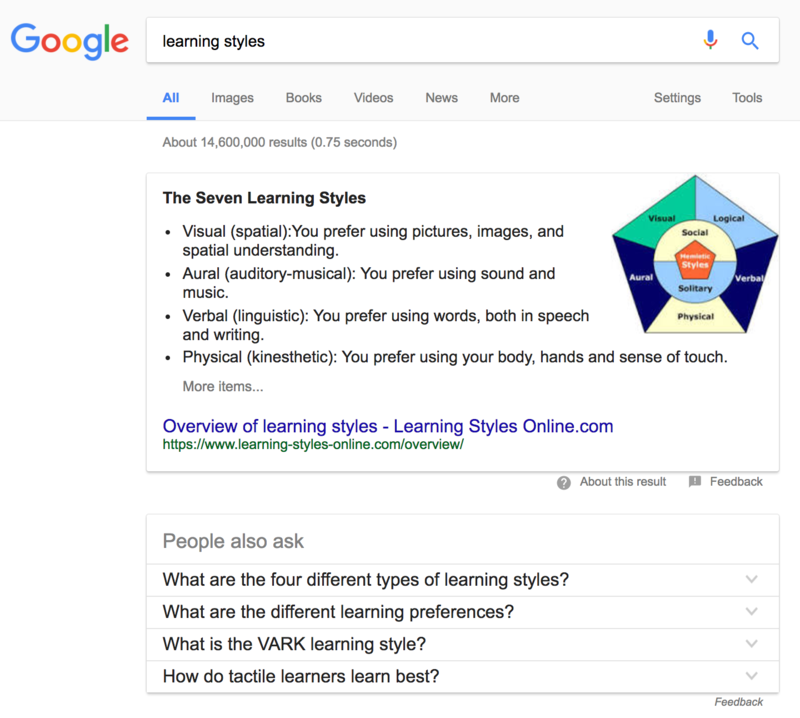 Another sign that learning styles have gained wide acceptance is its inclusion in Google Snippets, which provides excerpts at the top of a Google search results page. While Google has had issues with offering incorrect information for many different searches, it is feasible that a casual searcher would see this image and assume it to be factual. Why are learning styles theories false? Quite bluntly, despite many studies, there is no scientific evidence to support the claim that meshing the learning style with teaching mode improves student learning. The absence of positive evidence has left the door open for supporters of various theories argue that their favored theory works for them, falling into the trap of confirmation bias. In an excellent article from 2015 discussing why these theories persist, Willingham, Hughes, and Dobolyi explain that learning style theories will not die, because “it is impossible to prove something does not exist.” The authors go on to critique two core components of any of these theories. One, the assumption that despite different environments, an attributed individual learning style is consistent. Two, that regardless of that environment or what is being taught, if the individual’s learning style is matched, their learning will improve. There have been systematic reviews, some including meta-analysis, with rigorous methodologies that have come up empty-handed. There is a dearth of foundational, scholarly, peer-reviewed literature underpinning learning style theories. Stahl (1999) provides an excellent critique of the lack of peer-reviewed foundational references in Carbo’s Reading Styles Inventory theory, Fleming’s 1992 article on VARK references an article published in a current affairs magazine the New Zealand Listener, and the list goes on. In the (very interesting!) book “50 Great Myths of Popular Psychology, ” authors note that decades of research has failed to provide reliable ways to assess people’s styles, evidence as to whether you can train teachers to adapt their teaching to such styles, or even what constitutes a learning style (pp. 95-96). Several years ago, Willingham increased his longstanding reward for a researcher proving a learning style theory produces meaningful learning benefits from $1,000 to $5,000. There has as yet been no winner, with a design proving such theories are sound, but not for lack of trying. But why should this be a surprise? Learning style theories ultimately fall apart due to their own processes. By creating categories through cherry picking key attributes, then trying to fit individuals to these labels to elicit positive learning outcomes, they ignore the many other factors that influence learning. Librarians may be drawn to learning styles as a way to connect to students we only see once or twice. We don’t have the opportunity to get to know students in our library sessions very well, limiting our ability to tailor the workshop to those students’ particular strengths and interests. But if we design our classes to appeal to all different learning styles, then we could say we are being responsive to different students’ needs. The commercialization of learning styles has also kept them alive. Some publishers include learning style surveys as activities within textbooks, especially texts aimed at “first year experience”-type classes. In these works, identifying one’s learning style is presented as a strategy to become a better student. This situation is a bit of a chicken-or-egg one: do textbooks include learning styles because instructors demand them, or do instructors teach learning styles because the textbooks include them? Either way, their inclusion understandably leads to the students’ and instructors’ assumption that learning styles are accepted and uncontroversial. The learning styles myth can also be harmful to people’s perceptions of their own or others’ abilities. Carol Dweck’s research on mindset found that many people believe that personality, intelligence, and talent are things people are either born with–or not. As Dweck puts it, “They have a certain amount of brains and talent and nothing can change that.” Teachers and students who have a fixed mindset will view learning styles as natural limitations. You simply can’t expect someone–or yourself–to learn something if it’s not in the correct learning style. As Professor Frank Coffield said in an interview, “We do students a serious disservice by implying they have only one learning style, rather than a flexible repertoire from which to choose, depending on the context.” We see this self-limiting viewpoint expressed in the opening quote, and believe it is an unhelpful concept. Accept that learners do have preferences and strengths. Some people read quickly; some love mechanical tasks. (Interestingly, at least one study showed a very weak correlation between learning styles and learning preferences.) It is important to understand that no one teaching method will work for everyone. As Pashler et al. state, “it is undoubtedly the case that a particular student will sometimes benefit from having a particular kind of course content presented in one way versus another. One suspects that educators’ attraction to the idea of learning styles partly reflects their (correctly) noticing how often one student may achieve enlightenment from an approach that seems useless for another student” (p. 116). Flip learning styles to teaching modes. The different modes (visual, auditory, kinesthetic, etc.) need to change as your subject matter does. If you are teaching someone how to drive a car, we really, really hope you are giving your student a kinesthetic experience and not simply verbally explaining how to drive. On a more library-specific topic: when we teach about incorporating sources into your paper, we use the analogy of music sampling. This is most effective when we play the songs we discuss. Consider which mode might be most effective to what you’re teaching (while also considering student accommodations, of course). Think multimodal. There is evidence that learners benefit when instructors mix the modes up: a little lecture followed by a pair-and-share, a visual demonstration and then some hands-on practice. Changing up the modes will appeal to different students’ strengths and preferences, and will increase attention in the class. Hopefully, you now consider yourself armed with the tools to help put an end to the myth of learning style theories. And what about the next time you hear a student or colleague voicing an opinion about learning styles, similar to the one we quoted in the beginning of our post? You will have solid, research-based arguments to counter their beliefs, and well-founded pedagogical teaching methods with which to replace their misguided learning style theory.